My band FunkeeJunkee are playing at the Brambletye Hotel, Forest Row on Friday. Come along and beat the Friday 13th jinx! The great Lester William Polsfuss would have been 99 today! That’s Les Paul to you and me. Not only did he design the guitars that bear his name but also invented multitrack recording. Difficult to imagine what music would have been like if he hadn’t been around. He was also a very successful recording artist in the 50s with his wife Mary Ford. He kept playing almost up to the day he died, five years ago. Here he is playing with another guitar hero: Jeff Beck. Chord voicings on guitar Pt2. Get dominant! On a previous post I showed chord voicing options for dimished chords, using different combinations of strings. Here’s the promised follow up, showing how you can use this knowledge to derive voicings for dominant chords. Dominant chords are hugely important, not just in their own right but also as a basis for building much more complex and interesting chords. You can add just about any other note to the basic dominant and get a cool new sound. One of the most frequent additions is the b9 (flat ninth). 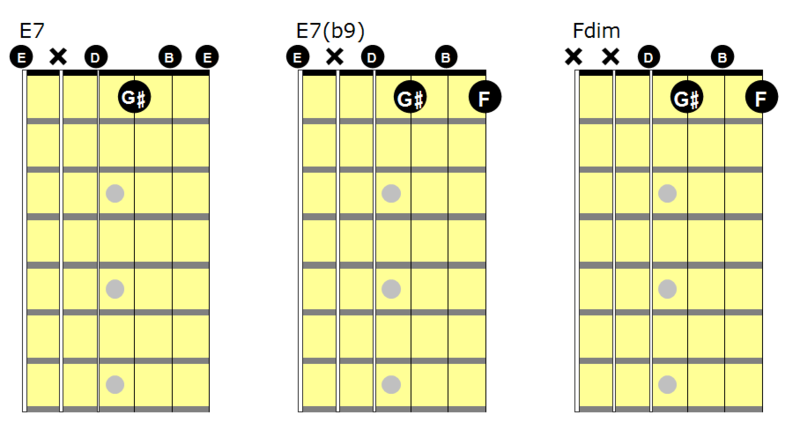 As an example that would mean adding F to an E7 chord. That’s just what the first two diagrams show. To keep things simple I’ve left out the low B, 2nd fret on the 5th string; but the open 2nd string gives you a high B, so the sound is still there. Go ahead and play the first two chords – it’s vital to get the sound into your ears and mind. Hear the sound of that F adding some bite to the chord? Here’s the thing. If you simply leave out the E (6th string) from the E7(b9) what you’re left with is a diminished chord – as in the third diagram. You can think of a diminished chord as a dominant 7(b9) chord without its root. Look at that third diagram. It’s pretty clear that if you lower the F by one fret you get back to a four-string version of plain old E7. That gives us the key to unlock the secret: in a diminished chord, lowering any note by one fret produces a dominant 7th. Let’s look at the dimished chord voicing on string set 4-3-2-1. From the position shown the diminished shape yields four different dominant 7ths when you lower each note in turn. This means that for each of the eight diminished voicings in the previous post you can get 4 dominant 7th voicings. Put it another way, for every dominant 7th chord you can find 8 different 4-string voicings if you’re clear on the diminished shapes. I’ll leave you to experiment with finding them and developing your own fingerings. Have fun! 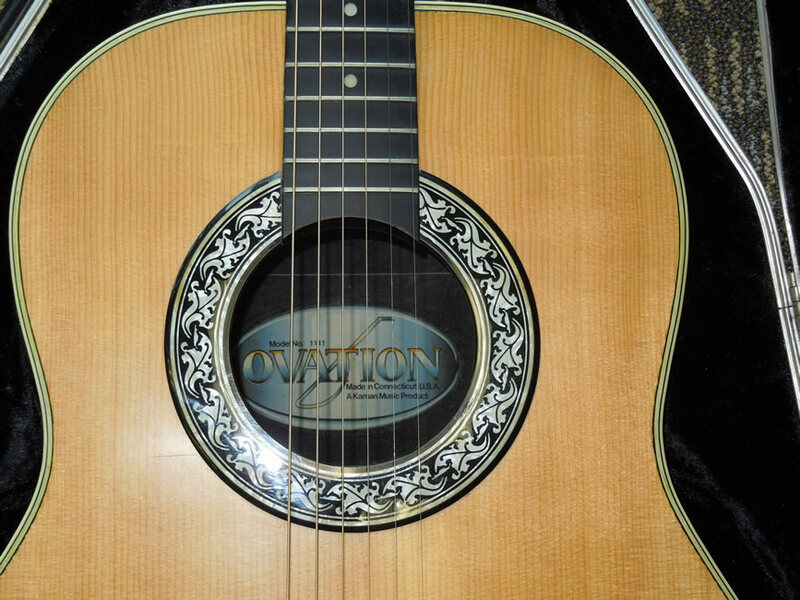 I had an Ovation Balladeer for many years. It was a great guitar – played well, good tone and projection, and equally at home fingerstyle, picking or strumming. But there’s something of a ‘frozen in time’ quality about Ovations now – as much a part of the ’70s and ’80s as long hair and four (or less) channels on the telly. They’ve dropped out of fashion and sales are low, so I guess it’s no surprise that Fender – who took over Ovation’s parent company in 2007 – have pulled the plug on US production. They’ll still be made in China, South Korea and Indonesia, but I wonder this is the beginning of the end. I’ve said before that I’m a big Joe Pass fan, and I love his duet recordings with the wonderful Ella Fitzgerald; so it was a great treat to find this concert recording on YouTube. The first half features Joe playing solo, as brilliant as ever. Then Ella joins him, and seeing (as well as hearing) the two of them together is just unbelievable. Quite apart from their skills as a player and a singer it’s a great demonstration of virtuoso listening, the way they lock together and play off each other.